The SkinIdent BODY LOTION VITAMIN SUPERis especially designed for the treatment of the skin on problem areas of the face and body. It is especially valuable for flaking skin with a tendency to redness and a damaged barrier function and skin with dryness and tension. 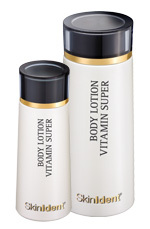 The BODY LOTION VITAMIN SUPER should be applied after a bath or shower. Skin friendly vitamins such as natural Vitamin E, Vitamin A, Panthenol (Pro vitamin B5), Vitamin C and Biotin (Vitamin H) restore the healthy balance of the skin, protect and optimize the hydration levels.